Feeling chilly and finding ways to cozy up and stay warm this winter? Seeing as how we’re from California, the cold is definitely not our friend. Khaled Nasr at (@sartoriomerta) // Focus: The modest contrast between his coat and suit. Nick Wooster at Pitti Uomo // Focus: The long silhouette his coat gives to his overall attire. 1.) Stay on top of your game with the overcoat -- The overcoat, whether it is a double-breasted coat or a chesterfield, is the “must-add” piece of the season! From warm colors like camel, desert stone, and wine red, the topcoat is one of Kipper Clothier’s favorite winter go-to’s! Wear it over your suit or layer it up over a sweater, cardigan, or warm henley; no matter what your preference, wear it boldly and unapologetically. This coat is meant to accentuate your silhouette and contribute grace to every step! Interested in getting a custom-made topcoat (or henley)? We have an array of colors and materials; just make an appointment and let us know you have a coat idea in mind! Logan Lerman for Mr. Porter // Focus: owning that "ugly sweater" the best way possible. 2.) Stay snug and snag that sweater -- Layer, on layer, on layer… Why not? Throw an “ugly” holiday sweater under your sports jacket or pair it up with a handsome urban bomber. The right way to go about sweaters is to throw in a bit of recklessness when it comes to color or even design; it doesn’t have to be perfect. Actually, we believe that the less “perfect” it is, the more character it has! 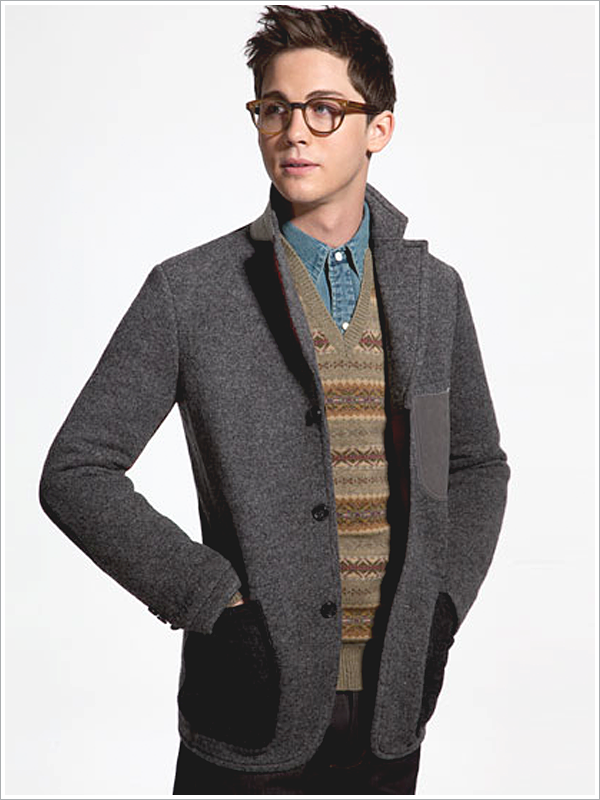 If you’re not a sweater person and prefer cardigans instead, we recommend shawl collar cardigans or partial zips! Keep the shapes in your wardrobe alive, or stick to the symmetry. You can do no wrong with a sweater during the winter. Pitti Uomo 89 // Focus: Go bold and get a scarf that brings on the patterns! Pitti Uomo // Focus: Drape your scarf and play with patterns to mold the perfect silhouette. 3.) Wrap it up with a scarf and don’t be subtle -- What’s the best way to keep your upper extremities warm? A scarf drapes (or wraps) around your neck, provides color and texture to your outfit, and bolsters the integrity of your overall attire by giving you length. Think about it; anyone who walks with a draping scarf on has graceful strides, and if they happen to figure out some knotting, or folds, then they get extra points for sophistication. Wear your scarves under the lapels of your coat, let them hang over your suit shoulders, or tuck it into a field coat or bomber. Remember to pick some charming colors, though! Keep the holiday spirit alive, or at least nod your head to those neutral colors that can’t get enough love (grey, black, camel). Landon Griffin (@thesuitedracer) // Focus: Keep warm by wearing a pair of gloves to up the anti. Milan // Focus: Pick your gloves carefully; some gloves are meant for specific situations, but all gloves look great and protect you from unpredictable weather. 4.) No need to warm by the fire, just wear some gloves! -- Are you going anywhere this winter? Maybe you’re headed to the woods for a quiet holidays, or maybe your in-laws live in the middle of no-man’s land where it snows and wheezes? Well, good news! Gloves are meant to keep you warm, and why shouldn’t they look good doing it too? If you’re not heading out to the middle of nowhere, wear some driving gloves that are made with thicker leather. You don’t have to be driving to wear them, they’re just great for some light warmth and easy maneuvering. Wear them with your suit or your casual layered outfit. The extra flair you get from your gloves will keep those heads turning. Take it from us! We have gloves in nearly every color (it’s a problem, really). Karl-Edwin Guerre at (@guerreisms) // Focus: You can never go wrong with a black turtleneck. 5.) Turtlenecks or “roll-ups?” -- In all reality, the name doesn’t matter, but the addition itself to your wardrobe does. From Pitti Uomo to Mr. Porter, all sartorialists are getting on that roll-up game and never letting go. Thin enough to layer, elegant, soft, and comfortable, turtlenecks go great with suits, coats, bombers, field jackets, anything you can think of! It adds this quiet, unprecedented effortlessness to your wardrobe and sense of style. It is the underdog of the year, it seems, and it will keep your layering game strong without providing any bulkiness to your attire. The perfect compromise for a winter work suit that’s not too casual or professional. Looking for more style inspirations for the winter? Pick up some tips from David Gandy as we pick out the “how’s” and “why’s” of this style-gentleman here, or check out some favorite fall essentials in The Bay Area are here!